Asparagus spears are the young shoots of what would grow to be a giant fern-like plant if we didn't eat them. They take a lot of time (3 to 4 years to produce from the day the seed is planted) and space (several square feet per plant) to grow; thus their exalted status as a luxury vegetable. Most asparagus in the U.S. is green, with some tender and sweet purple varieties popping up every now and again. In Europe, fat, white asparagus, which is grown under banked soil or sand to keep it from turning green, is preferred for its mild and gentle flavor. Asparagus is harvested from March through June, depending on your region. Early in the season spears may be as thin as pencils; towards the end of the season fatter, meatier spears become available. Note that thickness in no way indicates tenderness, which is related to how the plant is grown and how soon it is eaten after harvest rather than spear size. Poorly or long-stored thin asparagus can be tough and flavorless; fresh, fat spears can be remarkably sweet and tender. Buy asparagus as soon as possible after it is harvested. Farmers markets and stores that buy from local growers are your best bets for extra tender specimens. Look for smooth skin, bright green color, compact heads, and freshly cut ends. Look for asparagus that is as green (or purple or white in the case of purple and white varieties) as possible to up your chances as biting into tender spears. Note that 1 pound of asparagus is usually between 12 and 15 spears, will make 2 to 4 servings, and yields about 3 cups of cut-up asparagus. Some people recommend storing asparagus as you would flowers, in a vase of water. That's not always practical, and storing them in a loosely wrapped plastic bag in the crisper works fine, too. Just remember: the sooner you eat it, the better the flavor. Whether thin or fat, you will need to trim the asparagus before cooking. The fastest and easiest way is to hold the ends and bend the spear until it breaks somewhere in the middle, everything from the middle up will be tender enough to eat easily. 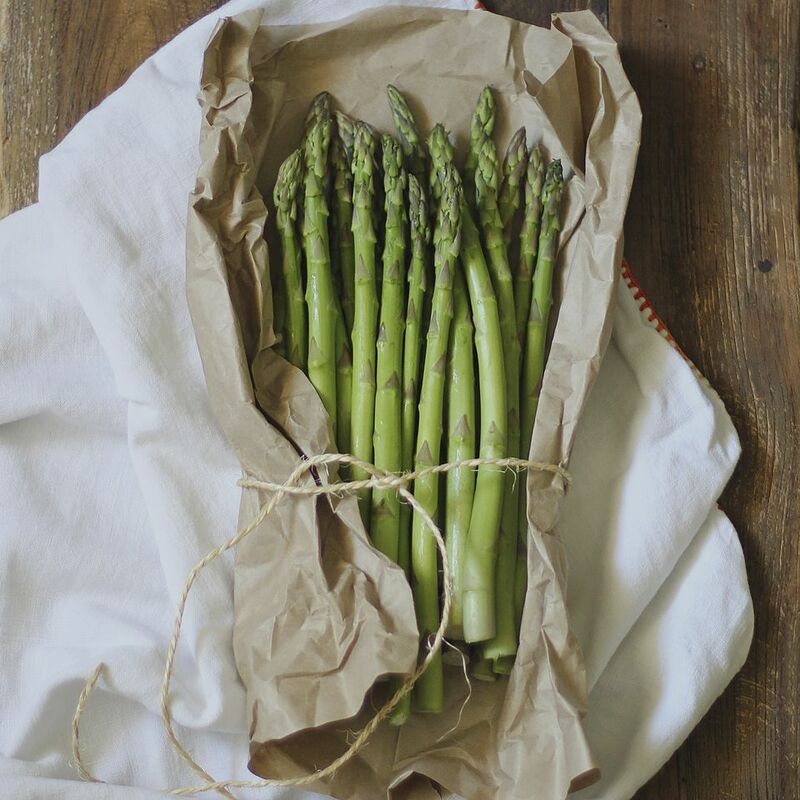 For less waste and a more elegant presentation of fatter spears, try peeling asparagus. Asparagus can be cooked many ways—roasted, grilled, steamed, boiled, pan-roasted, fried—and how to prepare it depends as much on your taste as the asparagus. Generally speaking, though, thinner spears are better for roasting, grilling, stir-frying, tossing with pasta, and even eating raw in salads. Thicker asparagus is traditionally left whole, so its tender, meaty texture can be appreciated. Try it steamed with butter or hollandaise sauce, or blanched and chilled with a vinaigrette or other dressing. The first asparagus of the season? Try it lightly steamed with a squirt of lemon. Taste that? It's spring.